“Cardio” is a great way to burn calories and keep your heart healthy. It could be as simple as walking on the treadmill for 30-60 minutes. However, if you’re just going through the motions, you could be wasting your time. Here are some tips to make sure you are getting the most out of your cardio exercise! Yes, it is true that the longer you stay on cardio machine, the more calories you may burn. However, you can burn more calories in a shorter period of time by simply increasing your intensity. 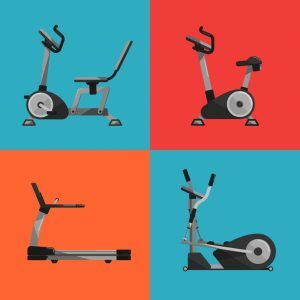 Whether it be increasing the resistance on a stationary bike/elliptical, or increasing the speed or incline on a treadmill. The “fat burn zone” of cardio is said to be at about 60-65% of one’s estimated max heart rate. At this intensity, 40% of your calories burned will be from fat. This is a fairly low level of intensity and would have to be maintained to for a much longer period of time in order to have a substantial benefit. When you increase your intensity to 75-85% of max heart rate, only 25-30% of your calories burned will be from fat. However, because more work is being done you will burn more total calories and consequently more calories from fat. Along with changing the intensity, try changing the type of cardio you do once in a while. The human body is great at adapting, and once it is acclimated the same form of cardio may not exhibit the same training effect. If you usually walk on the treadmill, try the bike, elliptical, arc-trainer, stair stepper, rowing, swimming… Try them all! Finally, it is very important that you eat! Starving yourself before can deprive you of the energy needed to complete a cardio session and starving yourself after will hinder your ability to recover from your workout. In the long run, “starvation” will negatively affect your exercise goals by decreasing muscle and retaining fat. On other hand, you must make sure you do not eat too much! Just because the elliptical says you burned 400 calories doesn’t mean you’ve earned yourself a 400 calorie meal. Firstly, the machines can only estimate calories so that number may not be 100% accurate. Secondly, weight loss comes down to energy in vs. energy out. So in order to lose weight, you must eat less calories than you’ve burned.